Gloria Gaynor’s “I Will Survive.” Rod Stewart’s “Maggie May.” “The Sweetest Thing” by U2. What do these tunes have in common? They were all “B” side hits. For those of you who remember records (those vinyl discs that music was stored on back when dinosaurs roamed the earth), you’ll recall that the popular songs were on the “A” side, and the secondary tracks were relegated to the “B” side. We’ve had some “B” sides in our travels, too, so I’m giving them their due in today’s post. In our (okay, my) overzealous quest to seek out BIG attractions, we sometimes visited places solely because of their size. Some have been less than a BIG hit with the kids. Still, I contend that there’s something interesting in all of these large sites, and not just because of their size! 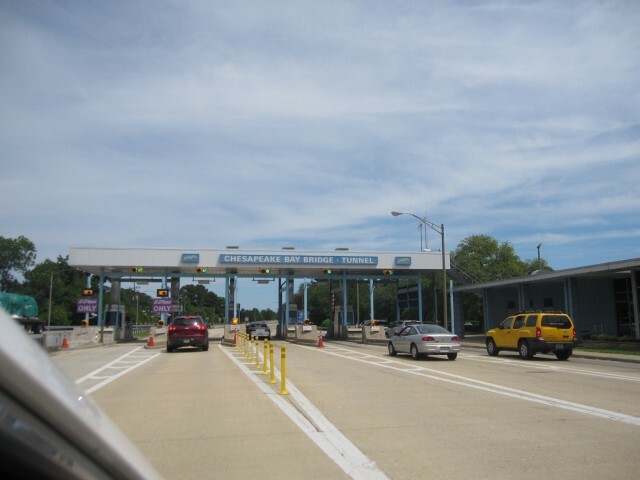 The Chesapeake Bay Bridge Tunnel, also known as the Lucius J, Kellam Bridge Tunnel, connects the eastern tip of Virginia at Fisherman’s Island to Virginia Beach. It’s summer, which in my book means road trips! 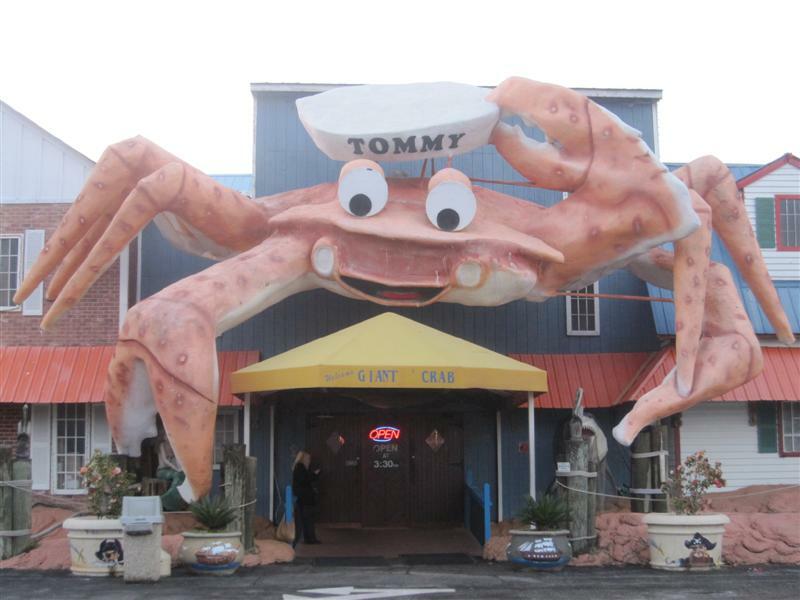 And when I think about road trips, I naturally think about quirky roadside attractions (and now I’m starting to sound like “If You Give a Mouse a Cookie”). Water towers are especially fun – and very noticeable from the road — when they’re painted to look like something else. 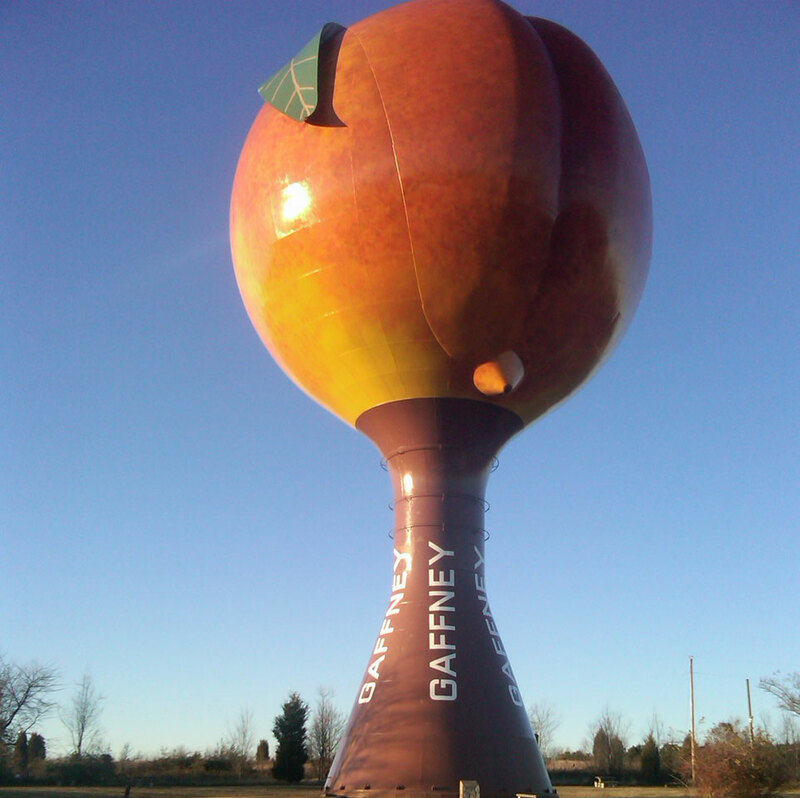 We saw the world’s tallest water tower in New Jersey, but it didn’t have half the charm of the “Peachoid” in South Carolina, the world’s largest peach. Where is it and how did you find it? The Peachoid has been a part of my landscape my whole life. You see, I grew up less than an hour from this peach-shaped water tower. Four-stories tall, it sits on the side of the road on Interstate 85 in Gaffney, South Carolina (Cherokee County) where it captures the attention of every passerby. I’m from Anderson, SC, and so any time I’ve traveled to Spartanburg or Charlotte, or indeed to Gaffney, I have the pleasure of beholding this incoherent piece of fruit. Why did you go there, exactly? I finally decided to pull over and get this particular picture in 2010 because my friend edits a newspaper in Scotland, and this was taken for her “Where in the World” section. Scottish readers had to guess where this pic was taken. Surprisingly, many answered the call with exact highway instructions! Okay, what was so cool about it? At the tender age of nine, The Boy tore through the first four books of the Harry Potter series over summer break. He found his preferred literary niche, and has remained true to all things mystical ever since. So when he had the chance to actually become a wizard at MagiQuest, and be a part of the world’s largest live action game…well, he showed more emotion that morning than most tweens do in a whole year. 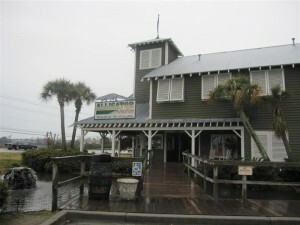 While planning our Myrtle Beach spring break trip, I read about the Broadway at the Beach entertainment and dining district. Then I noticed MagiQuest, and knew it would be a hit with everyone in our unabashedly geeky family. This is the largest MagiQuest location, and one of two “Mega Kingdom Realms.” (The second is in Tokyo.) There are three smaller “Kingdom Realms,” and ten “Forest Realms,” which are located within the Great Wolf Lodge indoor water parks. When you arrive for the first time at any MagiQuest location, you choose and purchase your own casting wand, which you keep and can use at any location. Through some super duper technology, the wands interact with video screen kiosks and the sets within. 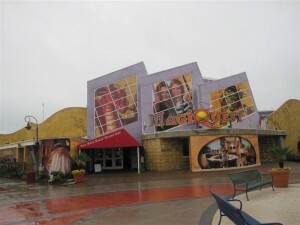 I’m feeling a bit guilty about the low rating awarded to the attraction featured in our last post. It was warranted, but like all “Go BIG” reviews, entirely subjective. It’s just that, with my background in PR, “positive spin” is my comfort zone. I’m also addicted to exclamation points, and have been accused of abusing the “Like” button on Facebook. So, to infuse my spirit with some rainbows and unicorns, I’m posting this today! On our adventure-filled holiday road trip, we detoured through Columbia, SC in order to see the world’s largest kid, EDDIE®, who lives at the EdVenture children’s museum. I was really looking forward to this stop, because I knew the kids would enjoy it, and it would be a welcome break from car travel. Unexpectedly, the northern winter weather we were racing from caught up with us. The city experienced its very first Christmas snowfall! 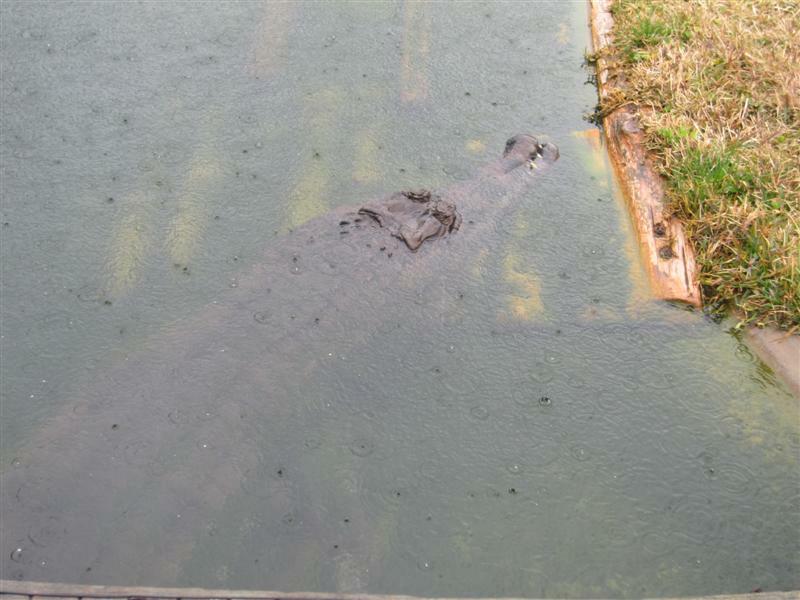 There were only a couple of inches, but it was a big deal there, and the museum opened later than normal. We were fortunate that it was a holiday week and therefore open on a Monday, because it’s normally closed on Mondays from Labor Day to Memorial Day. We’re glad we waited for it to open, because EdVenture is a fantastic facility — modern, bright, and clean. It’s the largest children’s museum in the south, featuring nine exhibit galleries with over 350 hands-on activities designed to let children explore and discover the world around them. 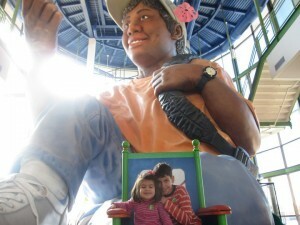 As soon as you enter the museum, you’re greeted by EDDIE, the world’s largest child! Weighing 17 tons, EDDIE towers 40-feet high, and he’s in the seated position! You can scale his vertebrae, investigate his brain, play in his stomach, and slide out his intestines. You have to access his innards from entrance points in his backside, on a few different levels connected by stairs. The higher we climbed, the less inclined The Girl was to enter, but The Boy was game for a look at EDDIE ‘S brain. If your kids are adventurous, and love to climb through the tunnel play structures at Chuck E. Cheese, then they will like exploring this exhibit. If they get frightened at climbing up platforms and across rope bridges, then they won’t be hip to EDDIE. What almost any kid will like, however, is sliding down EDDIE ‘S bottom half (along the gastrointestinal tract, if you get my drift). When they slide out, a noise is emitted which will get a giggle out of any goofball kid; mine included! It was a historic day in the city of Columbia, SC. The first Christmas snowfall. We drove into town and scratched our jaded New Yorker heads. It was merely a dusting; certainly not enough to stop everything in its tracks. But it did. The EdVenture Children’s Museum, our morning destination, had delayed its opening until noon, which put our road trip schedule behind. 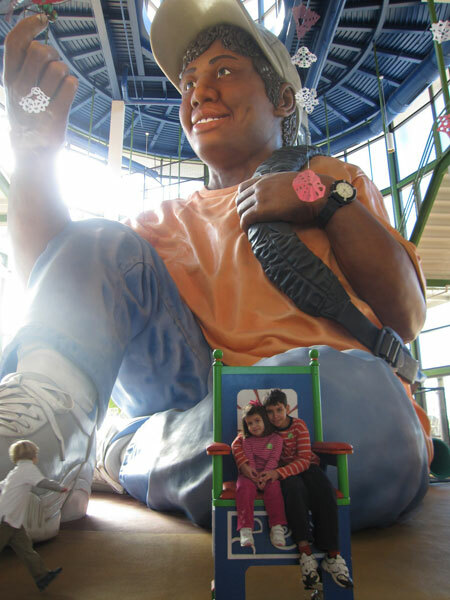 Next week, I’ll post a more complete description of “Eddie,” the world’s largest kid, who sits in the middle of the completely engaging and entertaining EdVenture Children’s Museum. 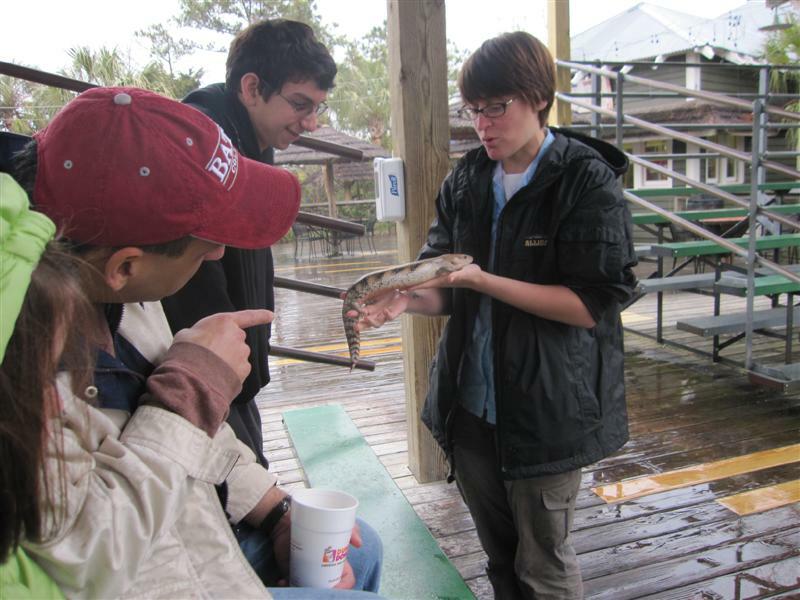 This attraction was well worth adding to our itinerary; the kids loved every minute. "Eddie," the world's largest kid! As it turned out, we should have taken I-75, because we got caught in a horrific traffic jam on I-95 through SC. We got back every penny we paid for “Nuvi,” our GPS unit, who found an alternate route along the kind of back roads which instantly bring to mind banjo melodies. No matter how many times I’ve driven into the state of Florida, it always takes me by surprise when I realize I still have hours to go after crossing the state border. It’s such a LOOOOOONG state! I also half-expected the weather to turn instantly balmy, but no such luck. Temps were still in the 30’s. We arrived in Tampa three hours behind our anticipated time, exhausted but safe.